This beer is now retired. The Butte Creek Brewing Co.’s annual winter ale was technically an American Brown Ale with Fuggle hops providing a balance to the malty backbone. 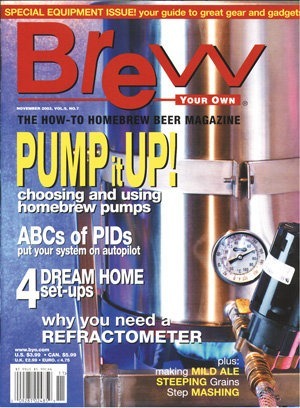 Frequent contributor and author Horst Dornbusch provides readers with a British mild ale recipe. An easy-to-make device for draining and drying your carboy. The theory and practice of temperature measurement in brewing. Brewing is hard work — so why don’t you rest more often? Let us take you step by step through the process of step mashing. Take your brewing light years ahead. In our guide to refractometers, we’ll show you how to measure your wort’s gravity based on how it bends light.